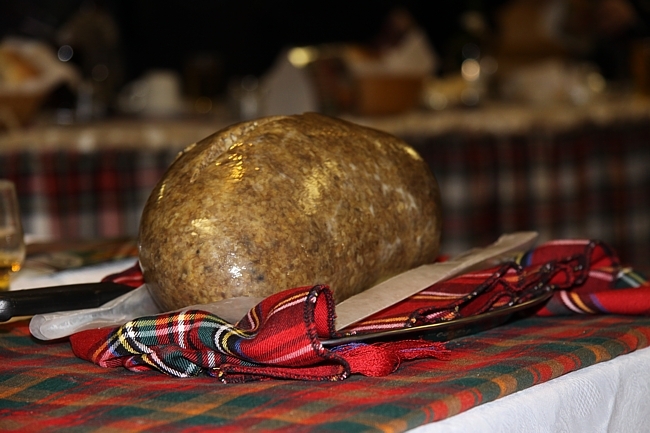 While many cultures have employed the stomach sacs of sheep, cattle, or goats in their culinary arts, the Scots perfected it with the dish known as haggis. In ancient times, the stomach sac provided a way of cooking the fast-spoiling offal - the organs and entrails - of an animal when camped out. Highland wives also gave this dish to their husbands to take with them on the long cattle drives from the Highlands to Edinburgh. 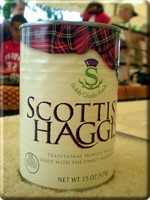 Made from the most convenient ingredients and easy to transport, haggis became a staple of men on the road. 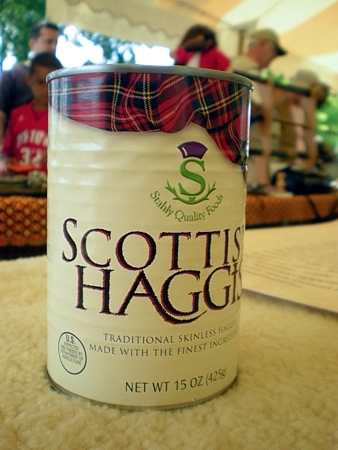 In more modern times, it has acquired something of a cult following, especially since taking centre stage at Burns Night celebrations. Note: The quantities of suet, onions and oatmeal, below, vary according to the size of the pluck. Trim excess fat and sinew from the sheep's intestine and remove and discard the windpipe, if present. Wash the pluck and place it into a pan, then cover it with water and bring it to a boil. Reduce the heat to a simmer and let it cook until all parts are tender, which takes between one and two hours, depending on the age of the animal. Drain and let cool. Spread oatmeal onto a baking sheet and toast for approximately 10 minutes, or until thoroughly dried out but not browned. Finely chop the meat and combine into a large bowl with the oatmeal, suet, onions, beef stock, salt, pepper, nutmeg and mace. Mix well. Fill the beef bung with this stuffing mixture to just over half full. Press the air out of the beef bung and tie its ends securely with string. Making sure to leave enough room for the mixture to expand, otherwise it may burst while cooking. 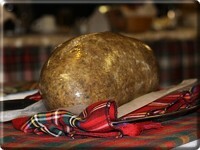 Place the haggis into a pot of water and bring to a boil. Immediately reduce heat and simmer, covered, for 3 hours. If the skin looks like it may begin to burst, prick it with a needle to release pressure. Serve hot with "neeps" (turnips) and "tatties" (mashed potatoes) and a glass of good blended whisky.